The remarks made by hedge-fund billionaire Paul Tudor Jones about how “babies are focus-killers” and more (Click here to see the video) has resulted in thousands of twitter responses, dozens of articles, TV segments and heaven knows how many conversations about what one thinks mothers can and cannot do in the workplace. I was compelled to write a response on LinkedIn which has been viewed over 10,000 times ( thank you) and resulted in more media requests than we ( with co author Susan Solovay) could handle. I was able to do two radio segments, one on Take Away Public radio ( Women Investors Pushing Back on Claim That Mothers Can’t be Traders.) and another on Bloomberg Radio. Many have asked me why did I take a stand on this and carve out heaven knows how many hours of my already packed week to speak out? My answer is complicated. First, as I stated in the OPED, my personal experience has been counter to the TRUTH that he presented. As a mother who breast fed my children, and continued to work and trade after having children, and knowing countless others who have done the same, what he said was outrageous and simply not true. Yes many women will opt out of intense careers, but many more will not. Two, the fact that he thinks this is likely means he does not hire women in to trading roles at his firm. ( I tried to find data on his firm but could not) That is a discriminatory practice and he should be called out on it. I hope investors in his fund take action. Three, he is a respected and listened to individual. He is a man of tremendous power. What he did is abusing that power by putting forth views that are not based on evidence, only anecdotes, and others may follow his horrible advice. The result may be that others now feel justified in not hiring women and more. He gave others permission to have those views and validate their own similar views. Forth, as the first woman trader to be made partner at Goldman Sachs I have spent so much time and effort encouraging women to consider careers in trading, and doing my best to open the doors of opportunity for them. As I said in one interview, Mr. Jones is worth over $3 billion dollars, and countless others have become ultra-wealthy in this industry. It is simply not right and just for women to be excluded from the OPPORTUNITY to succeed in this space because of strongly held gender stereotypes. Fifth, I care so deeply about this issue that I spent a good part of my year in 2009 helping to write a paper on the topic. ( and funding it) Because I kept asking myself the question “Why so few women?” I wanted to have a talented researcher really dig in to find as much information as possible to try to answer the question. As we laid out in our oped there are a lot of reasons, all of which suggest an intervention that can help level the playing field. So my BIGGEST HOPE in all of this is that this paper gets in to the hands of people with power, with influence, that can actually implement some of the solutions. Please download the paper and send it around to anyone and everyone who might care about opening the doors of opportunity in the financial services sector. I want to live in a world of greater access and opportunity and instead of just assuming we live in a meritocracy, we actively engage in making it so. Below is a summary of he solutions presented in “Women In Fund Management” to improve the representation of women in the financial services sector, and specifically in hedge funds. I added some additional personal comments. I truly wish there was a group that could take some of this on, and perhaps there is. The most logical one might be “100 Women In Hedge Funds” as their mission is to to make a difference in both industry and community through its three pillars of unique educational programming, professional leverage initiatives, and philanthropy. A lot to ask, I know. I am also going to reach out to Catalyst. Again, at a minimum I truly hope that these strategies get discussed at financial services firms large and small. If you have any suggestions please send them to me! Here is a brief summary of the solutions in the paper and please download the FREE report for greater detail. ADOPT A CRITICAL MASS PRINCIPLE – Research says that “magic seems to occur” in terms of changing the dynamics, decision making process and culture when diverse representation reaches 30%. This has to be the diversity goal. 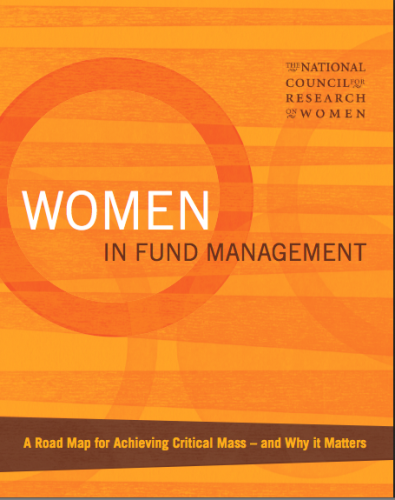 PUT MONEY WHERE IT MATTERS – Encourage women- and men- of means, and institutional investors, to use their wealth as a force for change by investing in women-managed funds and/or women-friendly companies. In addition, many public funds have mandates to invest in minority owned firms and that money remains unallocated. I have heard there is little accountability for such mandates and this could be the EASIEST thing to change. REQUIRE GREATER TRANSPARENCY AND ACCOUNTABILITY – Require registration of and reporting about fund managers, including those in hedge funds, so that the diversity of the field is visible and can be addressed. Given the nature of the hedge fund industry this is so hard but we as investors can ask questions. For large firms this has to be a goal. BUILD AND EXPAND PROFESSIONAL NETWORKS – Research has shown that supportive networks are critical for encouraging women and other under-represented populations to stay and excel in inhospitable fields. I have a pet peeve here and I too am part of the problem. Yes we need networks but we need THOSE networks to take collective action. Women have so much power if used collectively. This goes for internal diversity networks, organizations whose mission is to accelerate change, and other business and professional networks in the field. PROVIDE MENTORING OPPORTUNITIES AT ALL LEVELS – Institutionalize formal mentoring programs within firms and through outside networks that match younger women with more experienced women and men in the field to provide perspective and wisdom and to encourage professional growth. Love this but we have done so much of this. Has all this mentoring resulted in much of anything? I am not sure. Yes this is good but we now need to leverage all this mentoring in to other actions. HIGHLIGHT THE ACHIEVEMENTS OF SUCCESSFUL WOMEN IN FINANCE TO PROVIDE ROLE MODELS FOR OTHER WOMEN – Putting the spotlight on women fund managers and financial leaders challenges the perception that women are not well suited for careers in finance. YES YES. I invite all women managers, and especially highly successful ones, to PLEASE make yourselves more visible. I also invite media to SEEK OUT women to profile, highlight, and feature as thought leaders. Ladies put yourself on SHESOURCE now. I also invite a media outlet like BLOOMBERG to create a page on women managers and funds. CHANGE THE CLIMATE AND CULTURE – Ensure that leaders in the field communicate their commitment to building workplaces where everyone can succeed at the level of her or his capacity. This commitment must be institutionalized at all levels of the company’s hierarchy. This is huge. As evidenced by Mr. Tudor Jones there is a lot of bias out there and this is the hardest, hardest issue to address. I can just hope, and pray, that more senior business leaders have a ‘wake-up’ moment and acknowledge that perhaps they do hold on to stereo-types that affect their decision making and are preventing them from giving talent opportunity. I also know that there are many male leaders out there that truly are aware and sensitive to bias and I invite them to share their views and practices. Become visible male champion. SUPPORT AND FUND RESEARCH IN THE FIELD – To develop effective solutions, we need to understand the problem and measure the results. Let’s not forget what the question was that an audience member asked Mr. Tudor Jones that started this firestorm. He was asked to ” Please reflect on the make-up of the panel — rich, white middle age men who were mentored by the same and what it takes for someone different to have a seat at the table and finally share their voices from a powerful place.” Might a consortium of hedge-fund managers work together to consider this? I sure hope so and I am here to help in any way I can. William Alden – NY Times – When a Billionaire Speaks Off the Cuff on Motherhood. Previous Post Can mothers be traders? Next Post Here Comes Superman….Again….